Players build around the fringes of their territory, while trying not to get too close to other players for fear of attack. Players surprised me during a recent game. As one of them hit the lead, the other players co-operated with each other in an effort to stop that player. I must say that it was not my intention to make the rules play out this way, but instead, to create a more open game where player progress was easily identifiable. In saying that, it has effectively encouraged more player interaction. I felt this inadvertently reflected a real-world scenario, as players were put in a position where they had to compete, or they would lose the game. Some players, however, could do little because of their distance from the winning player, or their lack of resources. It played out really well and it created a spectacular and speedy end. Nothing promotes interactivity between competitors like a common enemy. Players sacrificed their own lead to work together and hold the winning player back. Each player worked only as hard as they had to, so that they would not affect their ability to win. This created an interesting scenario as it became a race towards the end. Players were feverishly counting the number of turns it would take to win the game. At the same time, they tried to stall other players just enough to stay ahead. The game certainly played out with the three stages I was after. 1. An easy building stage where people built up empires and strategically staked out territory. 2. A middle stage where players are more cautious, and their strategies are well thought out, (while keeping a close eye on other players). 3. The last stage; a mad rush to the finish, where players are counting every action carefully and using bonuses they’ve collected to gain advantage, and ultimately, try and win. A defensive strategy. The purple player has cordoned England off for later in the game, when space becomes an issue. Early part of the game: To make players build an empire and think strategically, there had to be limited space. A smaller board space and limited resources at the beginning meant players needed to concentrate on creating a territory. Good players laid their cities in a way that was easy to defend, or provided land for later in the game. Players found it difficult to attack early on as the distance between players made it hard to surprise anyone. 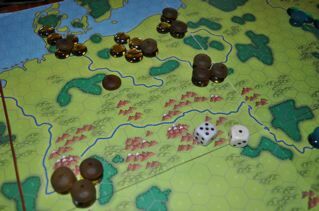 Players had plenty of time to build up defences while an enemy army approached. Players who did not spend at least some time building defences early on in the game found themselves weaker in the middle part of the game. 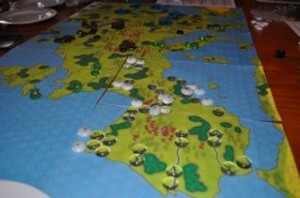 Players had to allocate resources evenly between their own strategy, while defending themselves against other players’ strategies. How well one plays this stage could potentially affect the remainder of their game. Midway through the game the board is starting to get crowded and players need for space is encouraging interaction. I would like to test smaller board arrangements to encourage more interaction earlier. 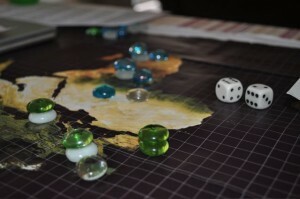 The mid-section of the game: Players could now see the other players strategies start to take shape, and build themselves up to counteract them. Any player trying to stop another player would be reducing their chance of winning. This meant players had to be very calculating when making their decisions. With only a limited number of actions, it severely restricted players from getting ahead too quickly. Balance was everything. Players could spend all actions in their turn when expanding, but then they may have found they lacked the technology and armies to defend themselves. 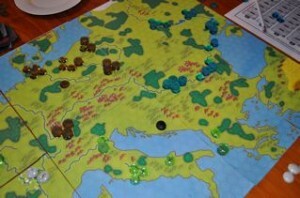 Players also may have spent all their action points on technology, without enough city tiles to be able to buy more technology or build the newly discovered units. 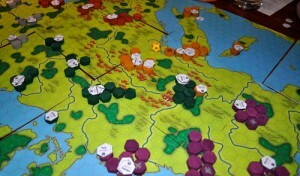 The final part of the game: Players could not win by surprise, as you could only collect one victory card per turn (this rule has been changed now, but a similar condition is now in place). Players could clearly see opponent progress, so they always had time to intervene. The limited actions per turn restricted players from suddenly building numerous armies or discovering a complete row of technologies. This has greatly increased creative playing styles and caused the players to calculate very carefully. I finally managed to co-ordinate a test play for the new and simplified rules, dubbed Sovereign Light. I gathered five people together to play, and it was amazing to watch how different each player approached the game. 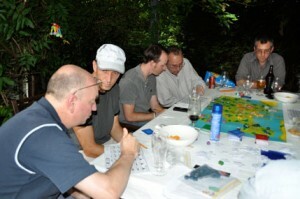 The main aim of this game was to play out some of the rules and identify dominant strategies in the game. I was focusing on three possible winning scenarios; trying to make each of these strategies balanced. Each player took their own, varied approach and we were able to recognise which strategies were going to pay off long term. 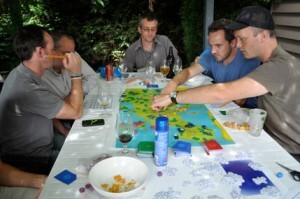 The different winning scenarios exist in order to create variation in play, but more importantly, they make the game appeal to different player types. The winning conditions appeal mostly to Achievers and Killers, although there is some room for Explorers. Socialisers will hopefully enjoy the act of playing a game in a group, especially since the game is aimed at 4-6 players. I am also thinking of introducing player cards that would list a nation, its leader, and some personality traits with advantages and disadvantages. This may add a role-playing element to the game, and potentially appeal to Socialisers even further. With a focus on the first three possible winning scenarios, it became evident early on in the game that fast expansion of small cities was by far the dominant strategy. I tried to vary my approach by not picking optimum strategies in order to test the extent of the disadvantage. The one player who did take an aggressive approach found themselves at a disadvantage also. We had to modify the rules slightly as it became immediately obvious that attacks on cities needed to be improved. One change we made was to the combat system; we decided that the use of the 1d6 + the bonus value worked fine, as stated in the previous post about combat systems. 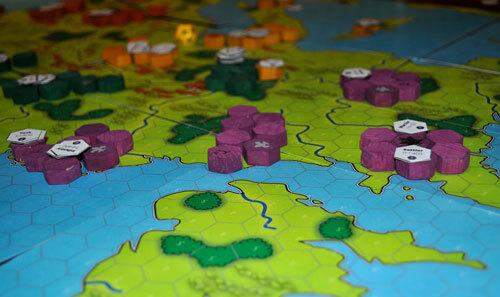 However, in the initial rules, only one unit could attack another unit at a time. We decided to change it so that the bonus could be compounded, then two units would add both bonuses together to increase the possible roll. This created an extra dynamic to attacking, and added an advantage to the combat approach to winning the game. It also allowed for army building, which adds some extra variety and strategy for the players. This shows the first part of an attack using an army. They attacked with three horsemen against one warrior. Another change we made is as follows. During an attack on a city, you can continue your attack move through the city so long as you don’t lose. This allows you to capture an entire city in one move. At this point we decided you could also split your army, by choosing to leave units in the captured ‘city tile’ and continuing with the rest of your army. I have created a diagram that displays a move one of our players made. This shows the second attack on the city, using only two horsemen and leaving one behind in the newly acquired tile. Using three horsemen in an army, the player attacked with 1d6 +6, against one warrior with 1d6 +1 +1 (city bonus), and then two warriors with 1d6 +2 +1 (city bonus). In the rules, only the army controlling the city gets the defensive city bonus. I did this to help players defend their cities early on in the game, and prevent it from finishing too quickly. I had originally set up the costs of settlers who can build new cities somewhere between the first city expansion and the second. This (I hoped) would discourage single tiled cities. This condition resulted in many cities of two tiles being built all over the board, which is fine, but it also means your points would increase very quickly with this method. Players, as a result, were not really thinking or doing anything else, so there was very little player interaction, and the level of strategy involved in placing city tiles was severely limited. Cities give native units a bonus to defence for all adjacent squares. This is not awarded to units who are capturing the city. After some debate, we found an approach which might reduce the effectiveness of this dominant strategy. While we did not implement it in this game, the test playing allowed us to recognise a flaw in the costings of city expansion versus new cities. We came up with a change where the defense of cities was affected by the layout and size of the city. This made logical sense for real world scenarios as well, which in turn supported the players suspension of disbelief. The change to the rules meant that cities were larger and stronger; two factors I was really hoping to encourage during the game. Strategy was an important factor in the game also, and I really wanted players to have to think carefully about how and where they built their cities. Decisions made earlier in the game could now affect play much later down the track. A player’s skill and in-game experience now made more of a difference to their success in the game, creating more player satisfaction. Our solution was one simple change; instead of a blanket +1, cities afforded a +1 for all adjacent city tiles (see diagram). This will hopefully encourage players to think carefully about their city location and layout, and placed shadow costs using only the highest point tiles. The simplicity of this rule made is easy for the player to quantify their choices. It is important for a player to be able to easily weigh up the odds when making decisions in a game. In order to make things fairer, I created one new rule before we played. 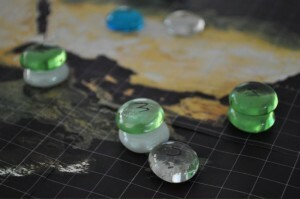 To prevent players from building single cities near enemies and making this a launching pad for large scale attacks, I restricted cities to only being able to produce as many units per turn as they were in tiles. In other words, a single tile city could only produce one unit per turn, whereas a city of three could produce a maximum of three per turn. Another constraint was that you could only have as many units in a city as it had tiles; this may work for combat as a winning strategy, but it needs some more testing. There was a real need to speed up the movement, which we had learned from the testing. Units moving faster meant that the combat would begin sooner, making combat a more valid approach to winning. In the past, players avoided attacking in the early stages of the game because units took so long to reach an opponent, that the opponent had two or three turns to build up a defence. So I doubled all the movement rates of beginner units and added a few more movement points to the later units. We did not progress far enough into the game to see the impact this had on the later stages of the game, but it certainly helped player interaction at the beginning. One small change (and I suspect there will be many more) was in the first tier of discoveries. We had a free city expansion, which all players happened to pick as their first move. This was the best option for a player, and any player not taking this course of action would have been disadvanatged. If it is a trivial choice, then why bother the player with having to make the choice. As a result, I have since moved the technology to the second tier to remove this temptation. It was important to address these kinds of problems and I will pay close attention to any similar issues. 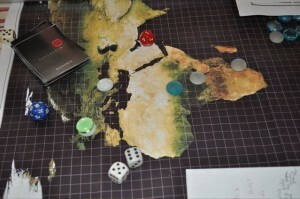 I have recently been investigating the use of different combat dice systems for ‘Sovereign’. This is mostly because I currently have the number on the dice going up to thirteen. Rolling and adding six-sided dice is not going to be fun for the player and will slow down play dramatically. I am also trying to avoid introducing ‘hit’ points, as this will add further complexity to the game. After some investigation, I discovered some alternatives. Here is a list of the systems I am now aware of, and have considered. 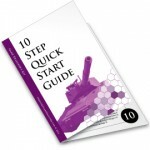 The system we currently use is 1d6 for each point of offence or defence a unit has. So a unit of 8 offence will roll 8 dice against a defending unit’s defence number. Whoever has the highest number wins the battle. In the case of a draw the defender wins. The losing unit is destroyed. I have tried to keep this simple by not including¬† things like hit points and making it only possible for one unit to attack another at any one time. This is a limitation of the simplification and I think I would like to find a way around this (more test playing needed). Offence rolls a 5, 3 and 1: defence rolls a 4 and 3 – the offence wins first roll (5 to 4), defence wins the second (3 to 3), and third attack roll is disregarded. 3 tanks with attack value 3 roll a 5, 4, 3 attack two infantry with a defence value 2, who roll a 3, 2. Each team has one successful attack/defend. Killing one unit from each team. Dungeons and Dragons, use a range of dice with bonuses adding to the resulting roll. So you can have a 4 sided dice 1d4 with a bonus of +2 having the potential to roll between 3 and 6. There are variations on this situation with range of dice types and in a range of games. There are many more examples, but most of them start to become more complicated and involve things like hit points or tables that explain how each combat scenario should pan out. This will most likely slow down the game. I have run some test combat scenarios with some programing trying to give some indication of the number of wins to loses on all of these situations. In doing so I was trying to ascertain how quickly the advantage changes in favour of the upgraded units. I am trying to avoid units becoming obsolete too quickly and hence players avoiding even building certain units in the first place. Of the combat systems I found the most appropriate for Sovereign was option 4. Reflecting on 2 and 3, they did not leave enough room for expansion of units. With 6 levels of research available we needed a certain amount of possible unit advancements and I could not get this to work well with 2 & 3. I was also trying to avoid using another system by directly taking it from an existing game. I found with option 1 that the odds changed too quickly. 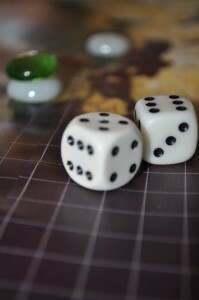 A player fighting with a 3 dice unit against a 1 dice unit had on average, a 95% chance of winning. This made units obsolete far too quickly. My goal was to achieve around 20-30% increase in the chance of winning as you upgraded allowing at least 3-4 upgrades before a unit was completely obsolete. System 4 also provided the opportunity to render units completely redundant at some point as well. I think this reflects reality, helping player immersion in the game world, for example a warrior unit would not be able to beat a marine because the difference was greater than the maximum warrior roll. As a result I have worked out that all units will roll one six-sided dice and then add their attack or defence bonus to the number. 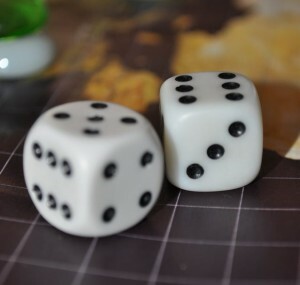 Five then becomes the obsolete point for lower units as the maximum difference is 5, a player rolling a minimum of 1 and a maximum of 6 on a dice. There is also an extra dice for defending cities and forts, which increases with future research. This adds an element of randomness/luck and improves the chances of players who are behind defending themselves while they catch up, and reduces the chances of an experienced players always winning against a novice. A good game goal is to have experienced players win slightly more often against novice players.